And in the “classic sci-fi slash social commentary films from the past”, we have Logan’s Run, in which the remaining population in The Future have been put inside a great, big bio dome. There, they live lives full of pleasure for thirty years, and then they’re taken to the Carousel in some sort of rebirthing ceremony. People are sucked up into the air and if they’re lucky, they get reborn. This is to keep population levels down so that the bio dome can sustain itself. Policing the dome and all its various areas are the “Sandmen”, who look out for “Runners” – people trying to escape. Here, we have Logan 5 (Michael York) and Francis 7 (Richard Jordan). Logan is given a special mission by the computer that controlls the whole thing, to find the mysterious Sanctuary, whatever that is, and report back. On one of the Runners they terminate, Logan has discovered an Ankh symbol, and when he later meets Jessica (Jenny Agutter), he sees her wearing the same symbol. He convinces her to help him Run, and together, they try to escape their hedonistic utopia, with Francis hot on their heels. Can they survive in the outside world? Really not sure what to make of this, to be honest. The special effects are cheesy, the models … look exactly like models and not at all like something real … it feels very 1970s with the hedonism and the wide-eyed and childlike cluelessness of the outside world feels not so much quaint but silly. Appropriate for the setting, okay, but still … silly. Thinking especially about the complete non-reaction to the cats – a creature they have never seen before, but that they’re totally okay with (shouldn’t you at least be a little freaked out if all life you’ve ever seen has been humans? They probably don’t even have insects in the dome! ), and the Planet of the Apes moment at the Lincoln Memorial. Aside from that, it’s an interesting premise, that of their bio dome and the life crystals in their palms and the colour coded clothing and all the rest of it. I wonder where the children and teenagers are, though, considering we only see babies and then adults. There doesn’t seem to be any sort of schooling either, considering they don’t even know what that big light in the sky is. So … I’m not sure what to make of it. Apparently it’s quite different from the novel on which it’s based, but I don’t really care as I don’t plan on reading it. The synthesizer music is distracting, because it’s always used as a “TEH FEWTCHURISTIX!” noise rather than a subtle background score. There’s a lot of running around and once they’re outside it feels rather inevitable that they realise that the dome they grew up in doesn’t necessarily have to be the be all and end all, and that they have to go back and tell everybody else about this great discovery. I would have been more surprised if they started growing carrots because it seemed like a good idea at the time. It’s all very spectacular, but it fails to reach any proper conclusions and it’s all a bit meh, to be honest. Maybe the re-make due to be released in 2014 (currently listed as starring Ryan Gosling and Rose Byrne) will do a better job of it. We’ll have to wait and see. 1.9 out of 5 clunky, freeze-ray happy robots. 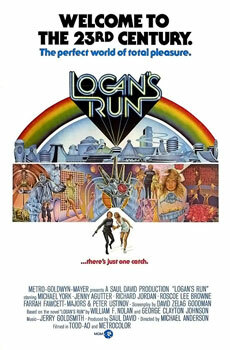 2 Responses to "Logan’s Run (1976)"
You are quite obviously not a Sci first fan as this movie is brillant. The book is also a fantastic read and the social commentary on a youth obsessed hedonistic culture to distract from the fascist government and killers/sandmen is highly imaganitive.